K10 is looking to recruit committed, reliable and trustworthy individuals that are passionate about working in the construction sector. We want to hear from you if you can demonstrate your desire to commit, achieve your qualifications and to complete the site work in your chosen trade. An apprenticeship is an opportunity to work for an employer and, at the same time, to receive training on site and work towards gaining nationally recognised qualifications. It is a paid job and a full-time, 5 day a week commitment. Am I eligible to apply for a K10 Apprenticeship? You must be 18 years old + and be eligible to work in the UK. K10 is looking to recruit committed, reliable, trustworthy individuals that are passionate about working in the construction sector. If you can demonstrate this then we would be delighted to hear from you. No. As long as you can demonstrate your desire to commit, complete and achieve your chosen apprenticeship and trade, we would love to hear from you. However, previous experience and/or qualifications will be advantageous, especially in trades such as plumbing and electrics. No, as long as you can afford to live on an apprentice wage. 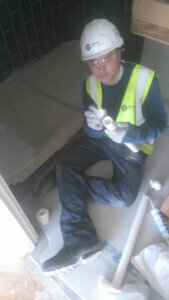 What if I don’t have a CSCS card? If you are successful through our recruitment process, we will arrange and fund your CSCS card prior to starting on site. The learning provider supplies the knowledge and develops skills while the host employer supplies the practical experience to put those skills to the test. Training can be classroom based, in a workshop or in a workplace, depending on the trade you have chosen. The length of your apprenticeship will vary depending on any previous qualifications and/or prior skills levels. Generally, apprenticeships take between 1 – 3 years. You can apply at any time of year. Availability will depend on the developments taking place in your local area. Click here to complete our application form. Please take your time to complete the application form and provide as much detail as possible ensuring you answer all the questions. K10 Training are now offering Traineeships. This is a great new opportunity to gain valuable work experience on major construction projects, get your CSCS Card and also free Personal Protective Equipment. Have no qualification at Level 3 or higher. Be able to travel to our training centre in Waterloo, SE1 0RZ and to site once placed. Louis came to K10 looking for an apprenticeship as he had never been given the chance to develop his practical skills. When Louis arrived, he had no site experience and although he had a Level 2 technical certificate in both Plumbing and heating and Electrical Installations, he had little knowledge of how an actual construction site operated. Louis joined our first cohort of Construction Skills learners and here, he was able to understand other trades such as carpentry, painting and decorating and tiling, as well as a refresher on plumbing and electrical. Louis attended the sessions in the K10 workshop for 10 weeks and always showed great enthusiasm for every part of the course, even the health and safety elements, which saw him gain a Level 1 Health and Safety qualification and a CSCS card. This 10 week course was a great chance for Louis to really develop his hand skills and understand just how the different trades all fit in with each other on a site. Once Louis had flown through the Construction Skills course, he was placed onto site to complete 3 weeks of unpaid work experience on site which is in Louis’ resident borough of Greenwich. This was a live construction project called Greenwich Creekside, which is managed by the contractor Innc Uk. During his time on site, he was able to gain great exposure to real plumbing and electrical tasks, something he had always wanted to do. For example, Louis assisted the M&E teams with tasks such as; Bathroom installations, containment work & snagging procedures for sign offs. As well as learning practical skills, it was important that that Louis also learned about the day-to-day running of a site and took part in things such as; Tool-box talks, weekly site meetings and general health and safety checks. 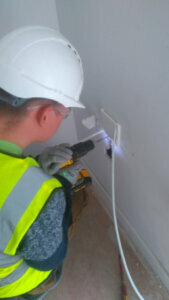 Louis managed to make such a good impression on Gloster that they requested his services as an apprentice through K10, meaning he is now an official K10 employee and is working with Gloster as a trainee plumber on Ballymore’s Royal Wharf project in Newham. It’s clear that Louis has come a long way and has constantly proved himself, well done Louis!